If you are a good player, have you ever wondered what the best way to buy golf clubs is? Have you wondered how the professionals are fit and how many good amateurs have perfect clubs? If you are a beginner, have you wondered how you should buy clubs? Have you wondered if you should buy clubs in a certain order? And if you know nothing about golf, but want to buy golf presents for family members of friends, have you wondered where to start? This is a fantastic book. It contains a wealth of information on a ton of topics. It goes into depth on each of them. It starts-off by describing how the professionals choose their equipment, but it quickly goes into the pros and cons of items for amateurs and recreational players. It even has a section for non-golfers buying gifts for golfers. 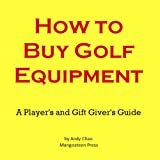 A big part of the book is how to buy golf equipment in the most cost-effective and game-effective manner possible. It also gives good insight into what the more important decisions are. I learned a lot in this book and I’m sure you will too. A few negatives are that the book is a little dense at spots, and there are a few typos, but the positive far outweigh the negatives. I highly recommend purchasing this book!